The following is an excerpt from some promotional material about the filming of the movie. It explains the retrofitting the Rose underwent to become the HMS Surprise as well as some of the techniques used to create the most accurate storm ever portrayed outside of a documentary. Another key “casting” challenge was finding the ideal vessel to portray the HMS Surprise, Captain Aubrey’s 28-gun warship. Early in pre-production, during a trip to Europe, Weir walked the deck of the restored HMS Victory, the vessel commanded by Lord Nelson in the Battle of Trafalgar. In addition, the director attended several tall ship festivals and spoke with scores of people from the worldwide tall ship community. 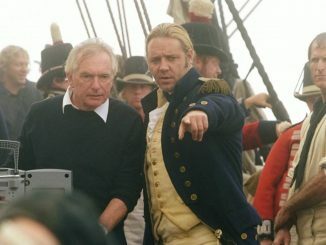 In 2000 Weir joined Captain Chris Blake (who would become one of the film’s many prominent technical advisors) for a cruise on the Endeavor, a museum-quality replica of Captain Cook’s famous vessel. A year later, Weir embarked on a second voyage aboard the Endeavor, this time bringing along producer Duncan Henderson, executive producer Alan Curtiss and cinematographer Russell Boyd. “I wanted to be sure they too would have the experience stored in their bones when it came time for our ‘voyage’,” says the director. Weir’s search ultimately led him to the American tall ship Rose, home port Rhode Island. The three-masted wooden frigate, formerly the country’s largest sailing school vessel, is a twentieth century replica of a 1800s-era British Royal Navy ship. Twentieth Century Fox purchased the Rose. (Upon completion of principal photography, Fox donated the ship back to a non-profit naval history organization.) The Rose traveled through the Panama Canal en route from Rhode Island to the West Coast, enduring a hurricane and a broken mast before arriving at a San Diego dry dock to prepare for her transformation into HMS Surprise. The filmmakers built a second “HMS Surprise” – the 60-ton tank ship – over a four month period. This ship was placed in a 6 ½ – acre water tank at the Fox Studios Baja – home to Titanic. This Surprise was constructed completely from scratch, with painstaking attention to detail, down to the lanterns, hammocks and the aging of the ship and its sails. 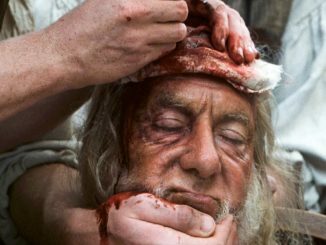 At the same time, New Zealand-based special effects house Weta Workshop, part of the “Lord of the Rings” trilogy effects team, built detailed ship miniatures. Their Surprise was over 25 feet in length. Additional models were digitally constructed in the computer of visual effects house Asylum. The massive tank ship in Mexico was mounted on a specially constructed gimbal, the largest ever used in a motion picture production. Powerful hydraulics brought to life the monstrous mechanism, which facilitated a complete range of motion, duplicating a ship’s movements at sea. “We rocked and rolled from Brazil to the Galapagos Islands in that tank,” says Weir. Director of photography Russell Boyd notes that thanks to the gimbal, shooting on the tank sometimes felt like filming at sea. “The gimbal gave a pitching and rolling motion to the set, so that the whole set actually moved like a ship at sea,” says Boyd. “We all had to develop sea legs fairly early on, just to work on the tank ship.” Boyd and his team used a techno-crane with a libra head, with the camera sitting on three axes—horizontal, forward/backward and leveling – enabling them to counteract the ship’s movement. A set representing the Surprise’s gun deck was also outfitted with a gimbal, and built on a bluff overlooking the ocean at Fox Studios Baja. This set, like the tank ship, could be rotated. A third gimbal was used for the Stage 3 Berth Deck, the low-ceilinged and cramped quarters where sailors slept in rows of hammocks and ate their meals. The Orlop Deck, the lowest deck of the Surprise, was situated on Stage 4, which later housed the Acheron gun deck, the site of major hand-to-hand fighting during the final battle. Fox Baja soundstages housed other sets representing different deck levels of the Surprise, including the ship’s Great Cabin, on Stage 2. The Great Cabin housed Captain Aubrey’s relatively elaborate private quarters and served as the backdrop for dinner parties for the Captain and his officers, as well as scenes where Aubrey sought solitude to contemplate some difficult decisions. The Great Cabin was also a meeting place for Aubrey and Maturin, who would relax by playing duets on violin and cello. Over a period of several months, the filmmakers constructed an Acheron tank ship, in a parking lot near the Studio’s front entrance. Upon this “Acheron’s” completion, it was carefully divided into four portions and moved by a giant crane down the street and into the tank for use in the final battle. As the sets were readied, the actors portraying the officers and crew of the Surprise underwent training to immerse themselves in the rigors of life aboard ship. 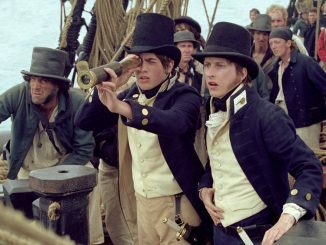 They trained in open ocean sailing on the Rose, climbing the rigging, navigation, small arms handling, cannons, sword fighting, military etiquette and learning how to perform the work of the characters they portray in the film. 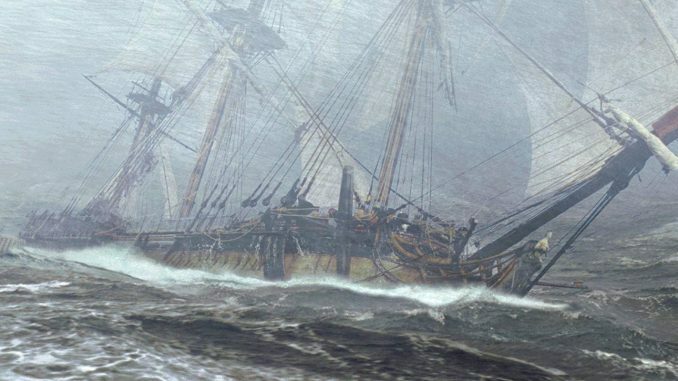 MASTER AND COMMANDER’s “invisible” effects contribute to the creation of an epic typhoon sequence, the likes of which have never been experienced on film. In the story, Jack Aubrey pursues the Acheron, the Surprise rounds the Cape, the weather worsens, the seas and winds grow merciless – and the biggest challenge Jack has ever faced lies ahead: the full fury of a massive storm – on a 120-foot square-rigger. State of the art visual effects merged with massive physical effects and, for the first time ever, real life footage of an actual storm captured on film at Cape Horn to create a typhoon as real as it is big. After cast and crew were positioned on the ship, the filmmakers brought the storm to life. First, they activated the gimbal, which put the ship in motion. Then wave and wind machines were switched on and water was pumped in front of two enormous jet engines, which broke down the water into a fog/mist effect. Four fans set up behind rainheads produced heavier rain, and, finally, massive dump tanks unleashed 8,000 gallons of water that cascaded across the deck of the ship, completely soaking cast and crew. The jet engines, wave and wind machines, fans and dump tanks combined to produce a deafening cacophony for on-set cast and crew. While these physical effects played a key role in creating these epic scenes, important contributions were also made by footage of a real storm captured months earlier by Paul Atkins, aboard the Endeavor as it rounded Cape Horn. This is the first time actual storm footage has been integrated into such a sequence – it makes it look bigger, more realistic, and lends a critical “you-are-there” feel to the epic scene. ILM created visual effects for another huge sequence – the final battle between the Surprise and the Acheron. Digital and miniature ships facilitated dynamic camera moves not possible while shooting at sea. Much of the effects work was subtle, such as eliminating the Mexican coastline from scenes shot on the tank boat. Digital artists removed these and other images frame by frame. One of the “construction” tasks that fell to the visual effects department was the completion of the masts. Due to the weight of the tank ship on the gimbal, the filmmakers had to construct a shortened version of the main and fore masts. The visual effects teams extended those masts, rigging and sails.